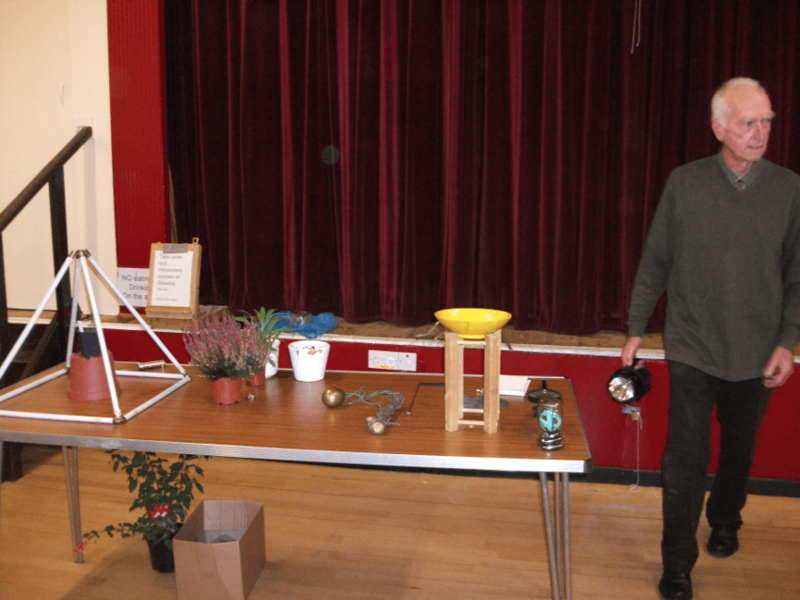 I arrived at Michael Haxeltine’s talk on Dowsing for Gardeners just as he was finishing setting up the array of experiments on the display table. Mike asked me to check for negative energy’s, so I walked around the hall and out the back to the washroom and kitchen and apart from finding the layout of underground water pipes, there was nothing amiss, I took my seat in the front row. 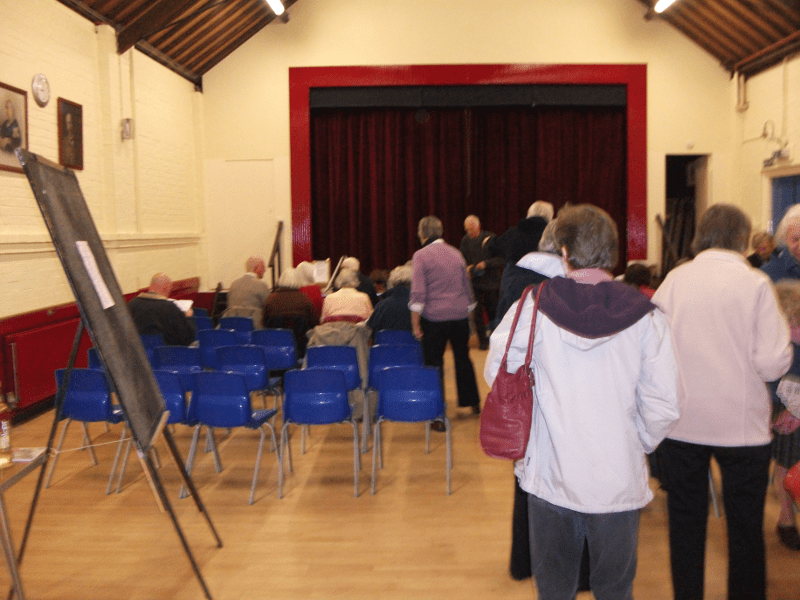 The hall filled up quickly with perhaps as many as thirty people from the Ash Gardening Society keen to hear what Mike had to say about using dowsing in the garden. After perfunctory greetings and a short introduction to some various dowsing tools Mike worked his way down the table of demonstrative experiments starting with the 20cm tall frame model of the pyramid of Cheops he demonstrated using the Cameron Aurameter how the Pyramid energy forced up the tool which is not only surprising, but a real demonstration of the subtle energies of the Universe that are undetected and incapable of being measured by current scientific instrumentation. This seemed to quieten the murmurs in the audience, Mike then started to discuss and explain how to use dowsing to identify the ideal planting position in the ground for a plant that had been growing in a pot. This is a quite a common failure for gardeners, with expensive trees or shrubs struggling to survive or grow once they have been planted out, even experienced gardeners fail to understand why a plant may struggle and limp along for 2 or 3 years before it begins to recover and grow. Michael explains that by standing over the planting location and holding the plant pot in one hand and a dowsing rod or pendulum in the other hand, you would ask the question ‘is this the best rotation position to plant this plant’ and slowly rotate the pot in your hand as the rotation turns the plant, your pendulum or dowsing rod will provide the ‘yes’ action giving the answer that this is the ideal rotation to plant the pot, Mike pointed out that the gardening advice and scientific reasoning can be found in his books. Mike then asked the audience to pick up their ‘L’ rod which he had earlier provided, one to each person, Mike provided some directions in how to hold the rod and asked them to hold out at arm’s length in front of their face, he told them to say out aloud or in their mind, ‘Point at my nose’, I had seen Mike use this simple experiment many times over the past 4 years and it always brought giggles and laughter as the majority of the audience discovered to their delight that the ‘L’ rod would slowly revolve in their hand to point at their face and usually directly at their nose. I used my personal rod for this experiment and joined in the fun. 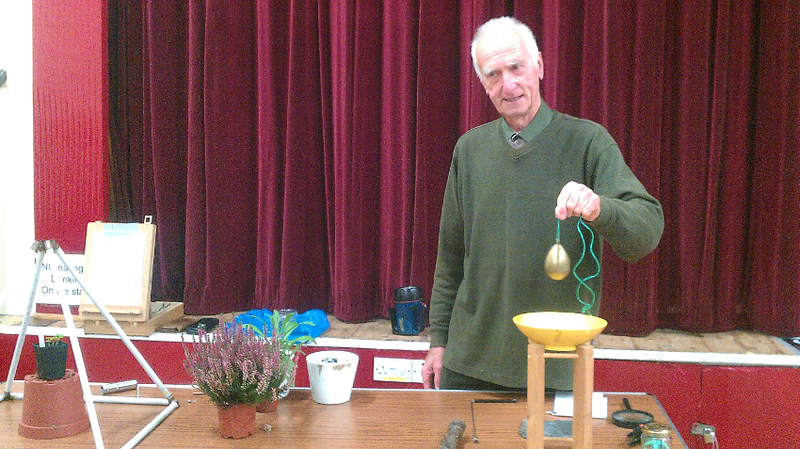 Now that Mike had shown that the audience could also dowse, he raised his ‘kilo’ brass weight that he used for a pendulum and showed how anything, large or small could be used as a pendulum and used to dowse with, my first dowsing pendulum when I was 12 years old was a piece of cotton thread and a button. Next up was a surprise to me, which was that Mike had hidden a small plastic fox in the hall before I had arrived, and he asked everyone to use their dowsing rod to see if they could find it, I asked the question and watched my rod slowly rotate and point at the wall to my right, when I raised my eyes from the focus, I saw several small water pipes rising out of the concrete floor and going up into the ceiling hugging the wall my rod was pointing at them although I was sitting down, I looked closely but could not see any plastic toy ‘poking out’ from behind the pipes. I turned my attention back to the audience to see what they were doing and about 3 people had their rods pointing in the same direction as mine. One guy had his rod pointing in the opposite direction which Mike spotted and commented that this was interesting as it could indicate that his polarity needed to be corrected and it was not unusual for first time dowsers to discover that their dowsing was accurate but would point in a 180 degree (opposite direction) to the object they were looking for, so something to watch out for. Mike then casually strolled over and plucked a two inch plastic fox out from behind the two small bore pipe running up the wall and even though I have been dowsing for some 40 years, you never stop getting a buzz from your dowsing when you are proven accurate. Mike returned to his table of experiments and demonstrated how you could use dowsing to identify the right type of soil for the two plants that he had brought along, which grabbed everyone’s interest again after most had failed in their ‘dowsing for the fox’ which if truth was known, is quite a tough thing to do if you’re a first time dowser, but simple questions like holding a pot plant in your hand and a dowsing rod in the other and looking at a sample of the soil (from your garden) and asking the question ‘is this soil good for this plant’ the rod provides an answer, Mike pointed out that his books contain all his dowsing experiments for anyone to check and proof that subtle energies exist, the books also provide the very latest ideas in the dowsing world on earth energies, worldwide energy matrix’s and much more. Mike and his brass pendulum that weighs approx. 1kg. It was pointed out that if your house is fairly new or on an ‘estate’ there was a good chance that the garden had been landscaped by the builders who possibly imported different soils in, or even left the sub-soil on the surface for you to plant into, all these factors as well as the plants final ‘rotational position’ will affect how quick the plant settles in, and starts to grow (some plants may take 3 years before growth starts as they acclimatise themselves to the new environment and some plants just plain die, so any edge you can provide by using dowsing to find the ideal location for the plant is going to benefit you as well as the plant. Then Michael started talking about using the moon as guidance for planting and how your dowsing rod can help in this planting regime, planting by the Moon has been going on around the world for thousands of years, planting seed during different phases of the moon, this has been documented as early as Roman times, and you can find many books on the subject. Although Mike talked about quite a few things that I have not mentioned here, his final part of the talk revolved around his eight month experiments with the Pentagon shape marked out in an open area in private woodland, this experiment had been documented successfully by another dowser during the 1980’s by a ‘A.P.Tabraham’ in the Isle’s of Scilly where the ground temperature inside the Pentagon was raised by some 2-4 degrees Fahrenheit depending on the day, Mike’s experiment showed that he was able to raise the surface soil temperature by between 2 and 6 degrees. Mike and I talked about this later and we considered the various authors who claimed to have discovered sacred geometric patterns in the English countryside, although we could not remember the names of the authors, this is an interesting thought, because if this type of marking out of geometric Pentagons or any specific shapes in large areas, the search for the reason ‘why’? could actually be to raise the temperature of the soil/fields for growing purposes. It could extend the growing season by weeks in our temperate country. A video of Michael seting up a temporary Pentagon shape with some chairs and then creating an energy circle (above). The intention of creating the Pentagon for a specific purpose would be reinforced by a person or people walking around the defined shape and projecting intention (thoughts) at the centre spot of the sacred shape marked out with posts or stones. This brings to mind ancient rural traditions of community dance, Morris men and the Wicker and Druid traditions of Solstice gratitude ceremonies. Finally another seed planted by Michaels talk was when he mentioned the Perelandra garden and workbook’s, this is definitely going into the land of the Fairy’s, but after some research when I got home, the Perelandra experiment shows that communicating with earth spirits in the garden has proven hugely successful, the garden and Perelandra organisation has been running successfully for more than twenty years.